Training for an Ironman has had an immense impact on many faucets of my life. Overall I think it has helped me to better balance the various roles I play as a wife, mother, athlete and as a results oriented IT project manager. It may seem odd that a sport with a reputation for extremes would help someone create a more balanced lifestyle but I think for me it has done just that. I have found there is something to the idea of lifestyle design that author and blogger Tim Ferriss promotes. I haven’t read his books or more than a little of the material on his blog (part of my own lifestyle design) but there is enough media floating around to understand that he believes changing your lifestyle can lead to big improvements in performance, in all areas of your life. I believe it can and does. Although I’m nowhere near a 4-hour workweek, nor do I want to be, setting priorities and delegating (or outsourcing as Tim would call it) have made a huge difference. 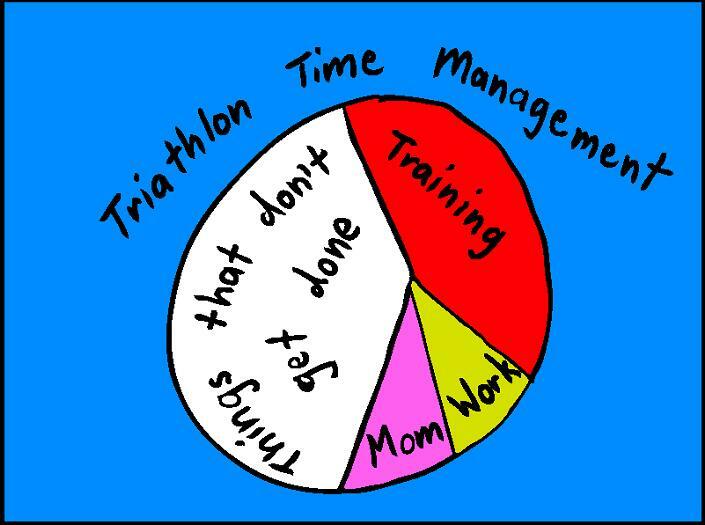 Here is little breakdown of how my lifestyle has adjusted to becoming a triathlete. As mom to three of my favorite people: Jerad 16, Zoi 9 and Eli 3, I get to experience all of the special joys of being a mom. Mixing together a busy family, a career and the training necessary to prepare for a full Ironman does not always go smoothly. But there are ways to make it work and with a little determination, some creativity and a lot of help it mostly has. When we recently came back to Portland after a year in Oakland, my husband Rodney took on the role of stay-at-home dad. While all three of my children are either in daycare or in school, which lightens the load a bit, it’s still a huge commitment. It gives me the kind of freedom to be an athlete that many moms either don’t have or don’t think they have. Rodney is still able to meet up with his running group (we don’t typically run together) and keeps busy doing consulting work, while I get more time to train. With approximately seven years separating each of my children it leads to some interesting insights. Disney World for example, is great for the whole family but Universal Studios is not so great for a 3 year old. Although I can’t compete with Disney World, as far as being a mom, I manage to cover the bases a little better than Universal Studios. I am mom to each of my children but in very different ways. For me, having children so far apart is also an opportunity to have them help make time to train. My two older children pitch in often which is a big help. My oldest is able to keep an eye on things on occasion while we’re gone. While that doesn’t necessarily mean that all the chores around the house are magically done when I get home, at least the house doesn’t burn down and my three year old doesn’t wander off. My mother-in-law lives in Portland and we are, at least temporarily since the move, living with her until we can find our own place. She’s also been willing to help with the kids, especially when we go out for long bike rides. Before I fell into the world of triathlon, work was #1. That has changed. I don’t think it has diminished my effectiveness and in fact has probably made it easier for me to see that other people are juggling priorities as well. I can still get everyone on task but hopefully with a little more compassion than the old me. The old me would never take a sick day from work. I was there early and stayed later than was necessary. Around the same time that I was becoming more serious about my new sport, there came a new job and a move to Oakland. Right up front I negotiated a 1/2 day off so I could use that day for a longer training session. It was the first of many lifestyle adjustments. Moving back to Portland I was able to return to my old job. During the time in Oakland my priorities had shifted. With my heavy training load I couldn’t work more than 32 hours per week. They were fine with that. Fortunately for me as well, my former employer was very very happy to have me back. The biggest difference in adapting my lifestyle to being a triathlete has been my own attitude. Making time for triathlon training has meant shifting my priorities. A lot of things that used to be important to me, a lot of things that I used to frankly obsess over a little too much, just don’t get done. Ironing was something that I used to do daily. Every night I would be ironing my clothes for the next day and all of the clothes that I had in my closet were arranged by color and grouped by pants, shirts and skirts etc. Now they are more or less just there and ironing is something I do maybe once a week but then again maybe not. I am a very A-type personality (I may have mentioned this before) and in my house there was a place for everything and I was very adamant about everything being in its place. Now there are a lot of things that I just don’t know where they are. I have grown a thick skin to things like dirty dishes in the sink, toys scattered around and I can’t remember the last time anything was dusted. All together it has been a great experience. Not just to see what I could accomplish as a triathlete but also to see what was possible. You don’t have to be stuck. If you want to make a change, big or little, set your priorities, ask for help and of course, do the work. If you’ve got a story about a way you are able to balance your lifestyle and still get the training done please leave a comment. I have a story about how i make it fit but how I got to the story was much more humorous… I pushed my cycling to the outer limits, time-wise, until my wife got frustrated. Then I knocked off an hour a week. We make that work. Now that she rides too, juggling everything does get tricky from time to time but we make it work very well – and I use out rides together as my “active recovery” rides. Nice post.